CAMPBELL, Calif., Apr. 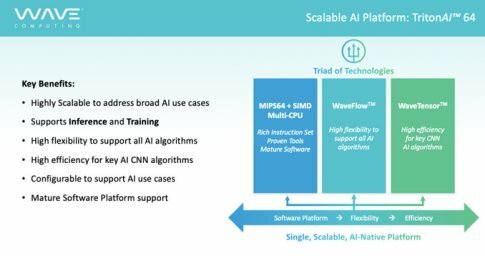 10, 2019 – Wave Computing®, the Silicon Valley company accelerating artificial intelligence (AI) from the datacenter to the edge, today announced its new TritonAI™ 64 platform, which integrates a triad of powerful technologies into a single, future-proof intellectual property (IP) licensable solution. Wave’s TritonAI 64 platform delivers 8-to-32-bit integer-based support for high-performance AI inferencing at the edge now, with bfloat16 and 32-bit floating point-based support for edge training in the future.